After six days of poker, including the two starting days, the Card Player Poker Tour Venetian $5,000 buy-in main event wrapped up late Saturday. 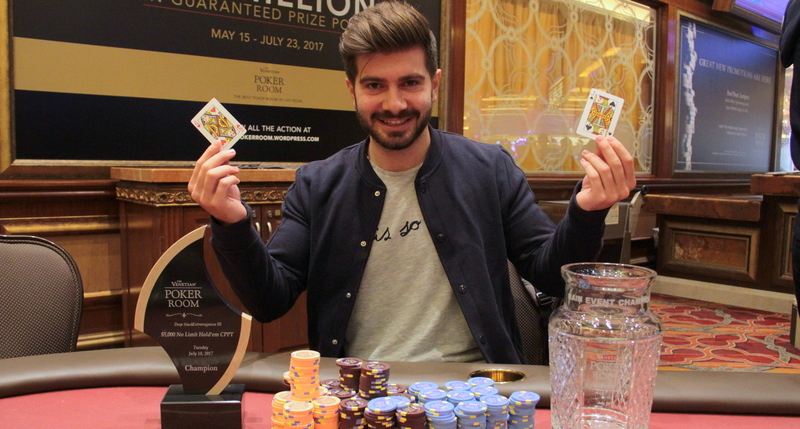 Javier Gomez of Spain won the event at The Venetian Las Vegas for more than half a million dollars after a lengthy final table, bringing his lifetime tournament earnings to more than $1.5 million. Gomez was the chip leader going into the final table, but he overcame a back-and-forth battle with Germany’s Paul Hoefer. Former WSOP main event champion Martin Jacobson finished third. The final three players ended up making a deal. They agreed to a chop based on chip counts but to leave $135,000 (paid equally from each player) to play for, as well as the Card Player Poker Tour trophy. At one point, the final three players agreed that they were playing too deep and they changed the structure by doubling the blinds from 50,000-100,000 to 100,000-200,000. After Jacobson finished third, the blinds were soon bumped to 120,000-240,000. After at least an hour of those stakes, Gomez and Hoefer agreed to a mandatory button bet of 480,000. The two were looking to end the stalemate. In the second hand with blind button bet, Hoefer was all in with K-Q against Gomez and K-2. Gomez flopped kings and deuces, but he ended up being counterfeited on the river. Hoefer had a commanding lead after that hand, but both players looked pretty relaxed and were each enjoying a beer. Budweiser for the Spaniard and Corona for the German. Gomez was in the mood for battling though, and he doubled up a couple of times before the final hand went down. Hoefer was down to only 10 big blinds when he got the last of his chips in preflop with Q 3 and was called by the Q J of Gomez. The board ran out 9 5 2 6 3 to send the German to the rail in second for a nearly $400,000 score thanks to the three-handed deal. The money bubble burst on day 3, with the final 72 players earning at least a couple of buy-ins back. A min-cash was worth $10,557. The event drew a massive field of 688 entries, building a $3,199,200 prize pool that blew away the $2,000,000 guarantee.